KlimaatGesprekken were featured in deVolkskranta, a big national newspaper, in February. What to do if you are depressed about climate change is in Dutch so use google translate or S3.translator for other languages. KlimaatGesprekken are mentioned at the start and end and there’s a quote from Rosemary Randall. The article sparked more than 25 people who want to participate in the groups. This builds on the 200 people joining last year and the team of about 30 facilitators. This year they plan to triple in size, to about 70 facilitators and 700 participants. Facilitator trainings for April and May are almost fully booked now. More recently there have been TV recordings of KlimaatGesprekken groups. The programme will be broadcast on the 18th of March. Updates when we have a link, and a circular to the riseup mailinglist too. It was a challenge for the participants to really deal with all the different themes in such a short afternoon, with cameras present. In spite of that the facilitators managed to connect people, help them think creatively and created a non judgemental atmosphere. We will see which fragments the producer uses when it goes out. Feel free to with any comments or suggestions. 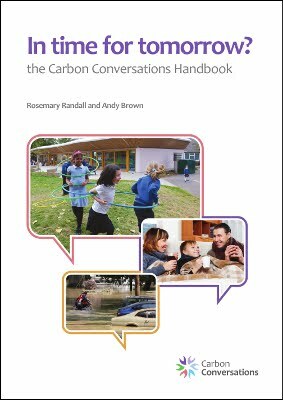 Download the pdf of this and other Carbon Conversations materials with the link above.